The flowers our Newburgh Florists work with are all of the highest quality and are also the freshest with a high longevity as they have been cultivated and then directly imported to us from our suppliers in Holland, a region in the Netherlands known for the premium quality of flowers grown there. 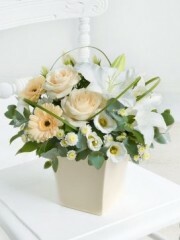 As our flowers are also extremely fresh, your recipient will be able to enjoy their flowers for many days to come. Our cultivators supply us with a huge selection of flowers ranging from traditional roses to elegant calla lilies to exotic orchids and gladioli amongst many others so no matter what you're looking for, we are positive our Newburgh Florists will be able to create the perfect bouquet for you. Our Newburgh Florists weave the flowers with lush greenery and seasonal flowers to create a dense, full bouquet body which is then finished off with complementary tissues, papers and ribbons or alternatively, our Newburgh Florists can place your flowers into a gorgeous vase or box depending on what you're looking for. Not only do our Newburgh Florists create gorgeous bouquets but they can arrange for a gift to accompany your flower arrangement. Our gifts range includes a selection of delectable wines and champagnes all rich in taste; luxurious Belgian chocolates; adorable and silky soft teddy bears; fruit baskets that can come in different sizes filled with different fruits; gorgeous-smelling candles as well as balloons. Our Newburgh Florists can arrange your balloons into a lovely balloon bouquet fitting for your occasion if you so wish it. Our Newburgh Florists want to go above and beyond for you, our customer, which is why they will always fulfill all your wishes to the best of their ability no matter how big or small your request is. Once your order of flowers and any gifts has been arranged by our Newburgh Florists, we are able to have your order delivered either locally or through the Interflora delivery network. 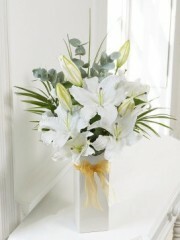 Through Interflora we are able to deliver your flowers not only locally but nationwide all over the far corners of the UK as well as abroad to over 140 different countries worldwide so no matter where your recipient resides, your order will be delivered in pristine condition to your desired location. The delivery drivers - both local and international - do their absolute best to make sure your order is delivered safely by driving carefully. Additionally, our customers are able to use one of our several delivery services. We offer our customers our standard weekly delivery every Monday to Saturday, our next day delivery service as well as our same day delivery service. The same day delivery service is particularly handy for those occasions that have cropped up out of the blue as it allows our customers to place an order and have it delivered on the same day. This means that our Newburgh Florists organise your flowers on the day which is why, if you wish to use this service, your order must be placed before 3PM to give them enough time to organise everything. We want our customers to know that once your order with us has been placed, our Newburgh Florists do everything they can to take care of everything on your behalf so you need not worry about a single thing.